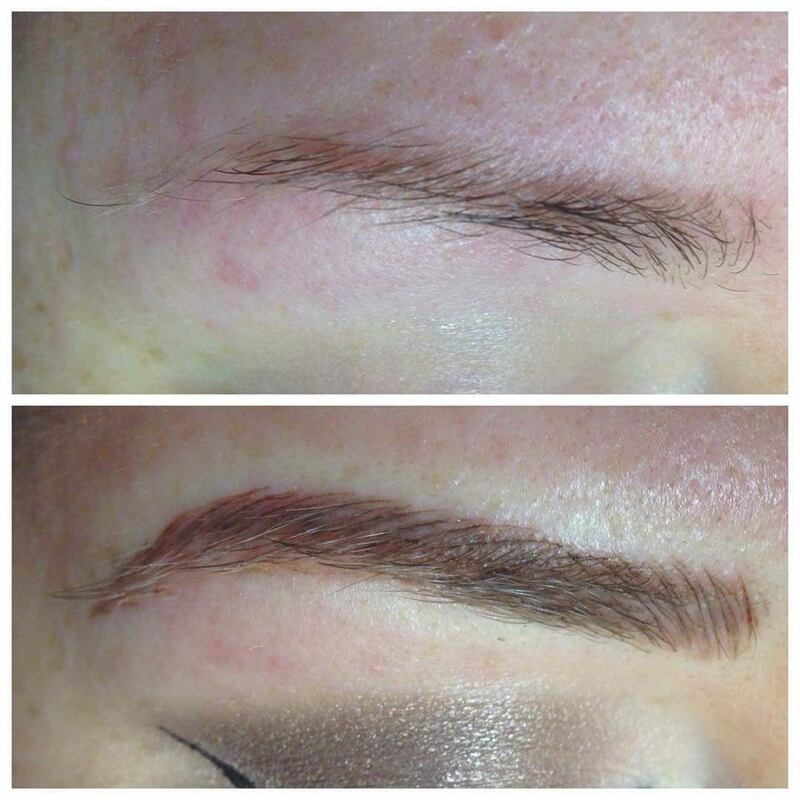 Microblading is ideal for anyone wanting to enhance the look of their eyebrows. The results are the most natural looking hair-like strokes, regardless of the amount of hair present. The pigments used in this method have been formulated to match your original eyebrow colour. 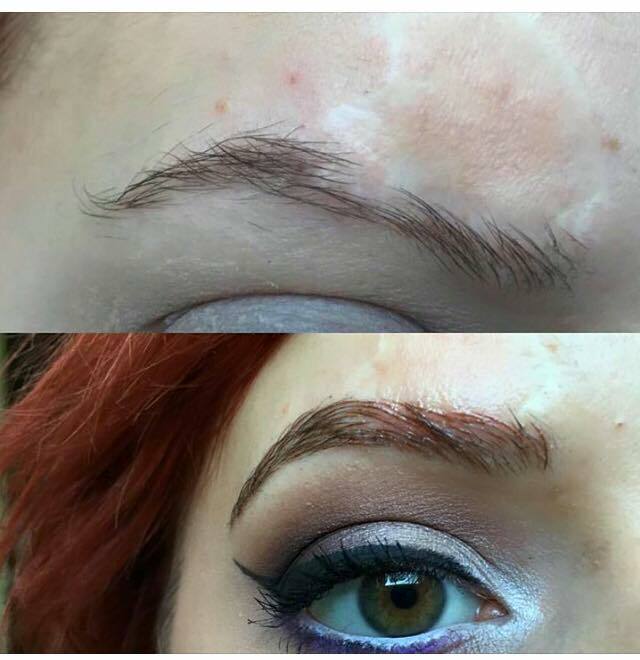 This method replicates exact brow like hair more so than a feathering technique used with a machine. This is a manual method, lasting up to 1-3 years. Ideal for all skin tones. One month after initial application, a 45 minute follow-up is required, this is included in the initial cost. During this second and final visit, the final shape and colour will be confirmed. 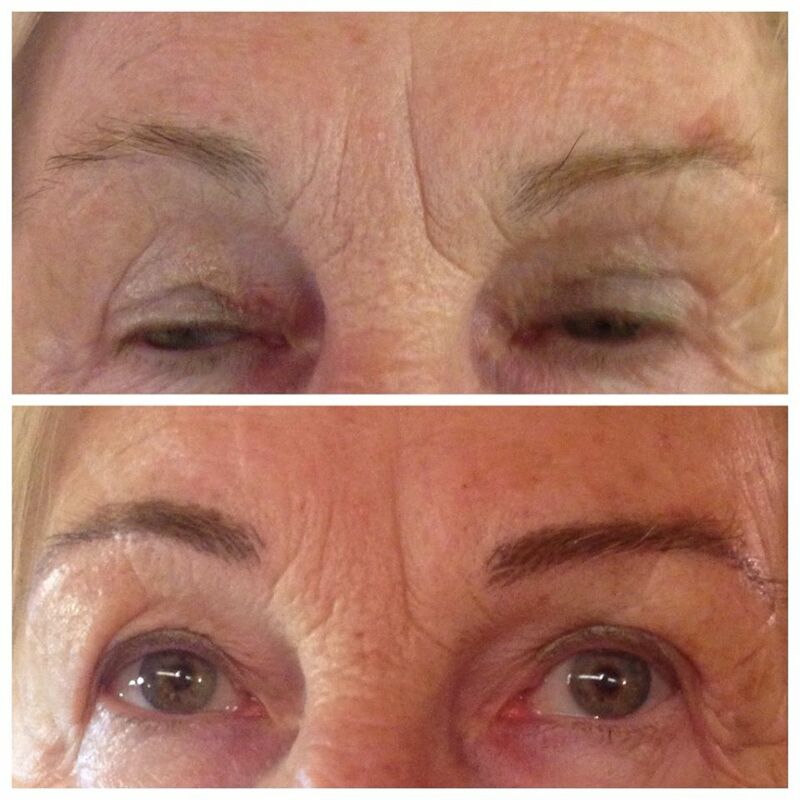 The brow is semi-permanent and a repeated application could be required in 1-3 years. Microblading, also referred to as semi-permanent makeup or micropigmentation, is the process of implanting colour pigment beneath the surface of the skin by means of tiny, sterile, disposable needles to produce the appearance of hair strokes, makeup, or to enhance the natural features of the face. How is this different than standard body tattooing? The purpose of Microblading is to enhance the natural features of a client. Microblading is softer and more subtle – it is meant to be a natural-looking enhancement. Body tattoos use ink while cosmetic tattoo procedures involve pigments. These pigments are designed to gently fade over time. Fading is desired as it allows the artist to make changes to colour and shape over the years as client’s natural colouration and facial changes occur. A highly-effective, topical anesthetic cream and gel are used for numbing before and during your procedure. Pain threshold levels vary from person to person and every effort is made to ensure you remain comfortable for the entirety of the procedure. Having this service performed during your menstrual cycle may increase discomfort during your procedure. If you are a frequent smoker, the topical anesthetics used during the treatment will not last as long. If you have been diagnosed with Fibromyalgia, be aware that this may affect your sensitivity tolerance to the procedure. Can i get Microblading if I am pregnant or nursing? As a precaution, we do not perform Microblading on pregnant or nursing women. Sun exposure: The sun will extremely soften the look of your Microblading, so sunblock should be used (once healed) to prolong your enhancement. The regeneration of skin cells: The longer the regeneration takes, the longer the pigment holds. The choice of colour: Some colours fade quicker than others, e.g. a blonde colour will fade quicker than a dark brown colour. Bleeding during the procedure: Any bleeding during the tattooing procedure will reduce the amount of pigment absorption. Alcohol and certain medications act as blood-thinners and should not be taken prior to and following your appointment. How should I prepare for Microblading? If you have an ideal shape and colour in mind, bring a few reference photos with you to your appointment. You may fill in your eyebrows as you normally would so we can take into consideration the shape you desire. If you regularly get your eyebrows shaped, waxed, threaded or tinted, please do so at least 3 days before your appointment. If there are any stray hairs that fall outside of our final shape, we can remove them. Do not drink any alcohol the night before and day of your appointment and limit the amount of caffeine you consume. It is highly recommended that you avoid SUN and TANNING BED exposure for 30 days BEFORE and AFTER your procedure. If you show up for your appointment with a new tan or a sunburn, you will need to reschedule and will forfeit your deposit. As your skin exfoliates from a sunburn, it will take the pigment with it. If you have extremely oily skin, Microblading will NOT work well for you. The constant production of oil will cause the hairstrokes to heal with a diffused, softer look. Your end result will look more powdered than you would expect. If you have little to no existing hair, Microblading will appear more 2-dimensional than those clients who have more hair naturally. If you are a frequent smoker, your pigment may fade sooner. If you are iron deficient or Anemic, your pigment may fade sooner and bleeding/bruising may occur during and after the procedure. PLEASE NOTE: If you have had your eyebrows previously Microbladed and are interested in a cover-up/re-work, we recommend a consultation before booking your appointment. 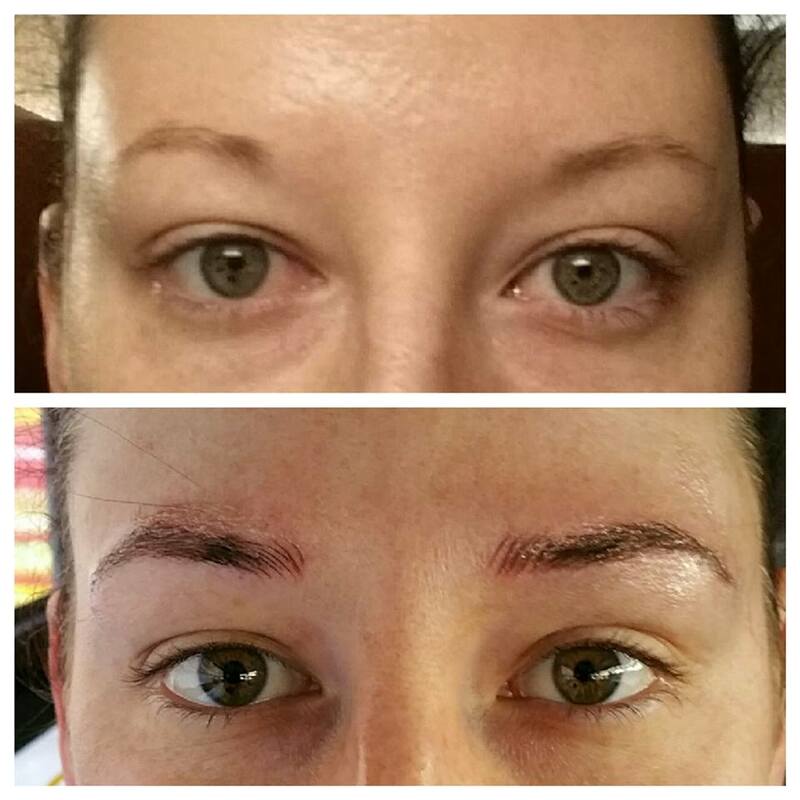 We cannot guarantee results for cases such as these and we must approve that your eyebrows are workable. Absolutely! We pride ourselves in having an immaculate and sterile space. We only use single use, disposable needles and supplies. This means that each set-up for each new client is discarded safely afterwards. Each of our Microblading stations are thoroughly disinfected before opening and after each procedure throughout the day.